I came across this blog prost recently: December 10, 2013http://www.blog.gr2010.com/?author=1The regular script and Bold highlights are by the original author. I have underlined a few important passages. The items in Italics are my comments and links. Dr. K. (Subbu) Subramanian, President, STIMS Institute Inc.
1) organizations are war zones in which people struggle not to join the ranks of the unemployed. Few people expect to have job satisfaction; “satisfaction” is having a job. Since market conditions favor the employer and not the employee, people are no longer all that important. People have become spare parts. This severe economic crisis, “organizations at war” and “people have become spare parts” is the reality in most developed nations, which are suffering the severe impact of the Binary Economy. This may not yet be the case in some startup companies or across the board in emerging countries, but it will certainly be the case for most established companies or businesses across the globe (it is becoming more of a case for IT sector also). The cornerstone of OD was to align the individual with the organization and focus on creating an environment which is good for the individual and for the organization. Thus, the relevance of OD’s value proposition appears bizarre at the present moment. Today OD has to focus on making sure each professional has the highest effectiveness – PE Score – which in turn translates to identifiable business impact. In other words, OD has to become “bottom up” rather than “top down”. We recommend the PE Score as the standard for all professionals and System Thinking and Transformational skills as the means to increase the PE Score. So, a chartered accountant who has a thriving business but violates accounting practices will find himself in deep water. Any scientist or engineer who is successful today will be in deep water soon, if they do not continue to exploit the principles of Science or Engineer pertinence to their profession. This is part of the System Approach. OD is a poorly defined profession with no borders. There are no agreed upon professional standards. Thus, commercial standards are totally dominating how OD is practiced. OD has become a commodity, sold by an OD vendor, and the OD practitioner must satisfy the client. If the client does not know what he needs, this is irrelevant because you “follow the money” and deliver what has been ordered. In most cases the client as well as the OD vendor is unaware that the needs of 21st century are not the same. They are Binary now: An organization to create a stream of New Solutions, and in parallel with an organization that can replicate known solutions in larger quantities. The requirements of these two parallel organizations – technical skills, people skills, risk taking, aptitude, System Thinking and Transformational Skills – are substantially different. A cornerstone of OD was to “speak truth to power”. If one needs to “titillate” and please the “customer”, the ability of OD to deliver on one of its major principles is castrated. The truth that needs to be spoken today is the emergence of the Binary Economy. Requiring the above two parallel modes for OD. Customers are not aware of this or focused on this. The OD support providers are not aware of this or focused on this. This leads to the above conflict – need to titillate and inability to speak the truth – between OD Support provider and the clients. 3) OD was founded by White Western and European males, and the Western values of OD are in line with those of the founders: participation, openness, authenticity, delegation, team work. Organizations are now configured globally. In most of the world, there is more autocracy, more secretiveness, more discretion than is seen in the west; many of the values of OD are seen as parochial and irrelevant to the way people should operate, especially when they are threatened as people are in today’s economy. These are not serious issues in the organizations focused on Replication Solutions (e.g): Large majority of Walmart workers or McDonald’s employees are not impacted by these issues of global cultures and management styles. But, this is true for professional workers (Scientists, engineers and managers, who work in global teams to create and implement New Solutions). 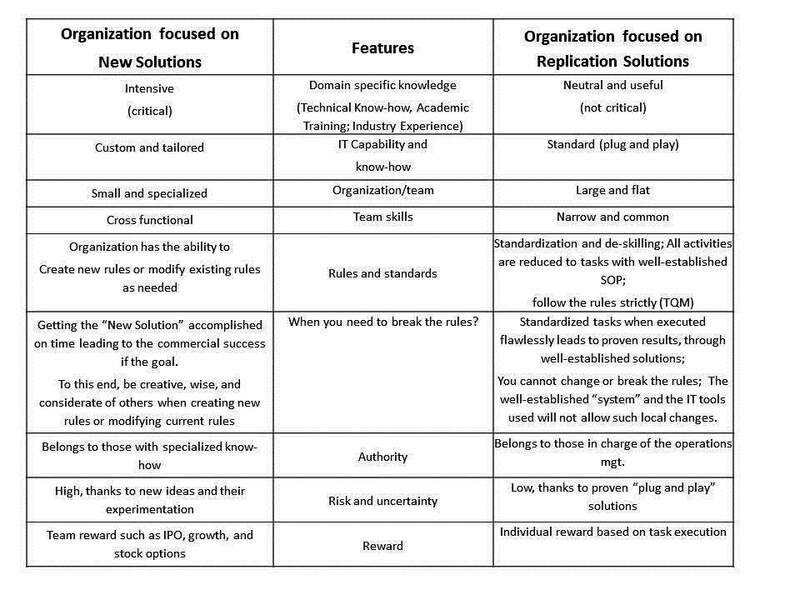 The OD developmental requirements (see the Table above) for these professionals – engaged in New Solutions organizations – are nearly the same across the globe. 4) As OD “stands its ground” and waits for the economy to “recover”, other professions cannibalized OD. Change Management promises those in power that changes can be “managed” with a set of templates. HR is disguising itself as a “business partner”, has cast aside/betrays the lobbying for the human resource and often serves as management’s 5th column to “deal” and contain the human resource. Unions and organized labor may/will fill in the vacuum. Certainly in the country where I live, re-unionization is rampant. This cannibalization is a reality in every profession. When the OD focus is largely for cost reduction, outplacement and out sourcing, then OD Providers serve this needs largely through Psychological counseling and rigorous training for effectiveness on standard tasks (such as speaking skills for call center employees). The Binary Economy requires structured and well executed OD development tools to growth the two parallel organizations at all levels in a diligent and sustained manner (and also in the right balance) unique to each company. 5) OD had a massive focus on communication. In organizations, people rarely talk too much anymore; they text and email and use portals. A major domain in which OD brought huge value is shrinking. Knowledge (Academic, Sector/domain specific and Transformational), Experience and Inter-personal skills are the legs of any solution for OD. Of these, the Inter-personal skill requires effective communication. This small part of the skill development has been the major focus of OD, as mentioned above. But this view of the OD has to change. 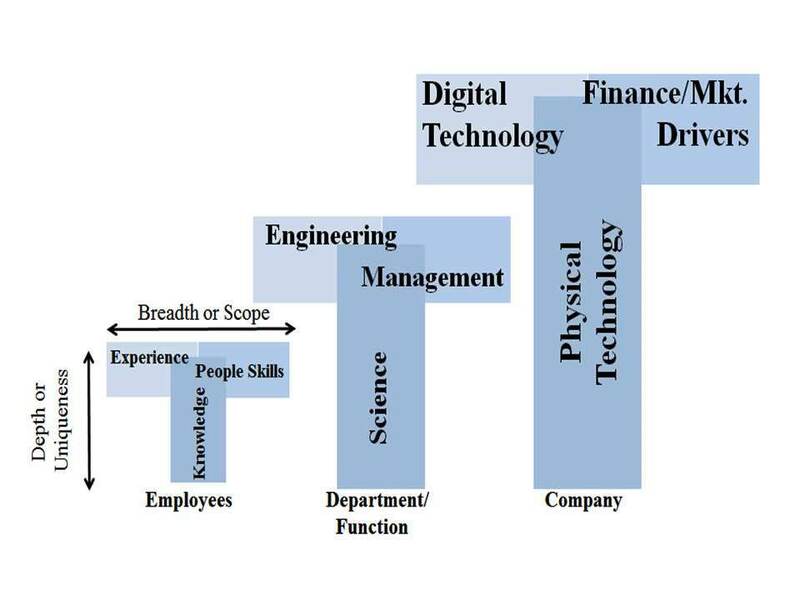 Instead OD has to become a system focused on a ladder of core capabilities, at the three levels: Individuals; Department/team; Enterprise/industry, leading to an organization of T- shaped thinkers and problem solvers. Previous Previous post: Scientists, Engineers and Managers – are they innovators and entrepreneurs too? Next Next post: Did anything go wrong?